Capacities from 125 to 8,000 pounds. Wheels available with other size bearings and other types of bearings. Please inquire. Heavy duty packed and sealed bearings that never need lubrication. Precision machined cold rolled steel specifications. Ideal for large or heavy gates and cantilever gates. Heavy Zinc finish for all weather conditions. The perfect replacement for those bothersome malleable pot metal wheels that are always wearing out. The smooth operation of the Wheel means less wear and tear on the gate operator, sprockets and chain. 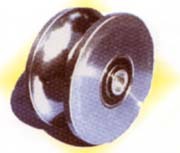 PIPE WHEELS: 1-1/2" to 1-5/8" Pipe Suge.